order blog camp moo cards. test the damn stickam ahead of time. plan the online times better and then be there. don't have book club discussion scheduled for during blog camp. be more realistic about how much time will be spent online and promise accordingly. i knew it would be great, but i'll admit i hadn't taken into account exactly how wonderful it would be to be together with my blog friends analog. buy a larger french press (or two) (or perhaps just smaller cups). more video (which for me means buy video camera). allow more time for photo walks (turns out when you are six people stopping to take pictures every two feet, it takes a lot longer than you would imagine). go to tivoli (this is for blog camps in denmark, obviously). don't forget to get a tattoo. don't forget the G&T sorbet you made and put in the freezer (i told you i was going to forget something). 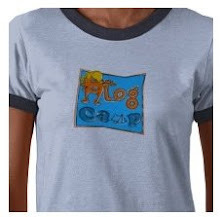 did you guys learn anything at blog camp that would benefit future blog camps? Have a good night's sleep the day before, instead of reading the book club book that you should have guessed was never going to get discussed! I learned I should definitely be there! I think my mum (seaside girl) learned that she really wanted a mac book! Fantastic, can I FINALLY break out and get a tattoo? Brilliant. I might tattoo my entire grudge book on my torso/legs/maybe arms, it's pretty extensive. I am taking on board the points re T shirt ordering and present ordering. I have already decided on presents for 1.5 but don't know if it's ok to do the same for 2.0. I think not. Hmm. I suggested to Beth that we have a 'crib sheet' for each attendee for 1.5, I'll do a 20 questions or something. So we all feel reasonably 'well prepared' for each other without spending hours revising each others blogs (especially for us newbies). check out which blogs your fellow blog campers are following - if there are some they all follow, take a look at them (if you have the time). spud: great idea with the crib sheet! Pratice keeping mouth closed in photo's and danish stick throwing game. Who is going to blog camp 1.5 and 2.0? I'm feeling the first Southern hemisphere blog camp coming on. Maybe in February when the weather is at its best? I wonder if anyone would make it?